Types Of Signal Degradation: I've subjected the following unmastered mix (Ex01.01:WAV/MP3 ) to a variety of the signal degradations mentioned in Section 1.4 of the book, so you can learn what each sounds like and therefore troubleshoot your own setup problems more quickly: two types of analogue clipping distortion (Ex01.02:WAV/MP3 ; Ex01.03:WAV/MP3 ); digital clipping distortion (Ex01.04:WAV/MP3 ); glitching from digital-clocking or software-driver issues (Ex01.05:WAV/MP3 ); comb-filtering from double-monitoring (Ex01.06:WAV/MP3 ); and a sub-unity-gain feedback loop (Ex01.07:WAV/MP3 ). Audio Impact Of Two Affordable Isolation Transformers: Anything that you put into your signal path has the potential to impact the sound, so if you're going to use isolation transformers to interface balanced outputs with unbalanced inputs, or to avoid earth-loop problems, then it's as well to be aware of the extent of the audible difference they might typically make. To give you an idea, here's an unmastered mix I recorded first through a pair of TRS cables directly into my audio interface (Ex01.08:WAV/MP3 ), and then through the two different budget-friendly isolation transformer boxes I mentioned in the book: the ART T8 (Ex01.09:WAV/MP3 ) and the Ebtech Hum Eliminator (Ex01.10:WAV/MP3 ). Affordable Transformer Isolators: The two transformer isolators mentioned in the book are the ART T8 and the Ebtech Hum Eliminator. Orchid Electronics also make very affordable transformer isolators to order. 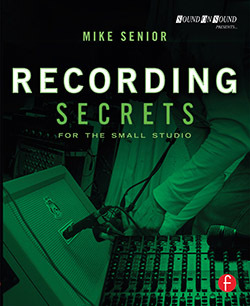 Pseudo-balanced Cables: The pseudo-balanced cable shown in the book is available directly from Sound On Sound magazine's online shop. Specimen Flowcharts For Assignment 1: Click here to download specimen Assignment 1 flowcharts based on the example studio setups shown in Figures 1.9 and 1.10 of the book. Aligning Analogue Tape Machines: There's plenty of information about aligning tape machines to be found on the web, but here are a few choice resources: UTAC's Practitioner's Guides, which include a large chapter on Analog Tape Machine Alignment; the Analog Rules Tape Recorder Alignment Instructions; this three-part series from Mix Magazine (Part 1; Part 2; Part 3); and these slightly more entry-level Analogue Tape Machines & Analogue Tape Machine Maintenance articles from Sound On Sound magazine. Metering Standards & Gain Setting: If you want to know a bit more about different metering standards, check out these Sound On Sound magazine articles: The Ins & Outs Of Gain Structure; Metering FAQ; and Interfacing Analogue & Digital Equipment. Cable Coiling: The most widely used professional cable-coiling method is usually called 'over/under' coiling, although the specifics of the exact coiling move actually vary between different engineers (for example, here's a video showing two methods and another showing a third alternative), so it's worth experimenting to find the one that feels most natural to you. Personally, however I prefer to use something like the Overhead Knot method shown here in a small-studio situation, because it's a lot quicker to teach to volunteer helpers when I'm recording budget sessions on location.